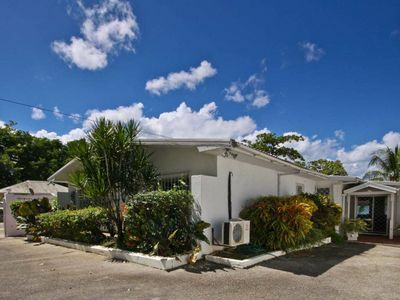 NO 1 Porters Court Luxury Villa, 4 mins from the beach. 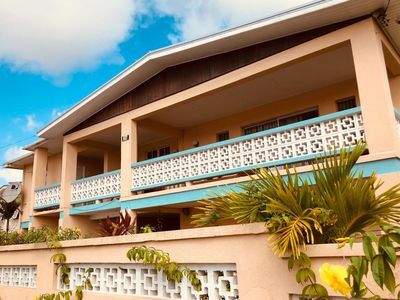 Our charming holiday villa in St James Parish Barbados is just three minutes walk from the crystal clear Caribbean sea, with stunning views & coral beaches, opposite the Royal Fairmont Pavilion Hotel on the west coast in the parish of St James. 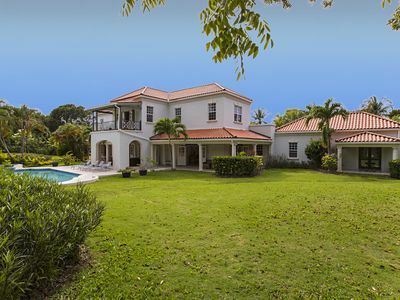 Porters Court is an exclusive gated development of eight luxury chattel style villas nestled around a swimming pool in tropical gardens. 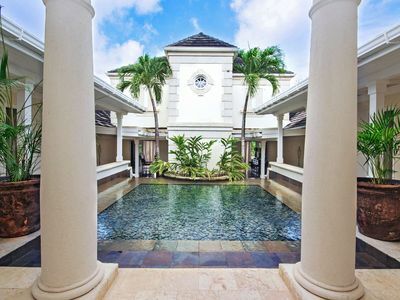 No 1 is one of the largest open-plan villas with a private garden. 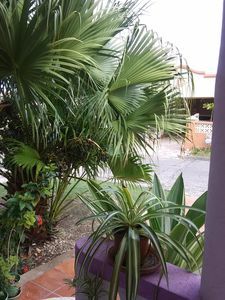 The exotic planting is representative of the Caribbean and Barbados. Our gardener visits Mon -Fri to look after the gardens and empty the bins. The pool is serviced twice a week to keep everything in order. The price you pay is fully inclusive of electricity water etc. No hidden bills. 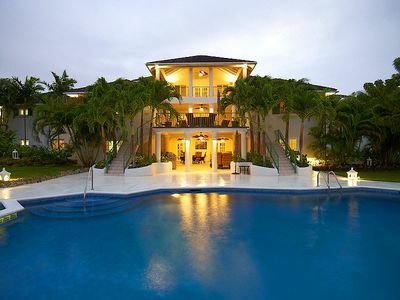 Number One Porters Court is a Barbados holiday rental with a touch of luxury. Its high ceilings of traditional 'pickled pine' offer two en-suite king size bedrooms that can be made up into either twin or king-size beds and sleeps, four people. 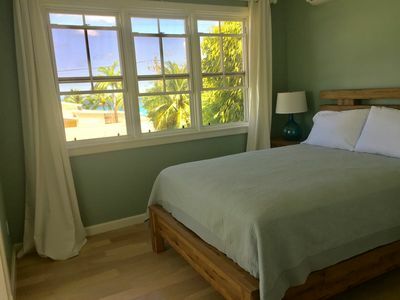 An extra bed can be hired at $25BDS per day. This will fit comfortably in the second bedroom. The beds are fitted with cool crisp white Egyptian cotton sheets. Air conditioning and ceiling fans will keep you feeling comfortable. The wraparound veranda is perfect for outdoor dining. Watch the Hummingbirds feed on the tropical plants whilst enjoying a leisurely breakfast. 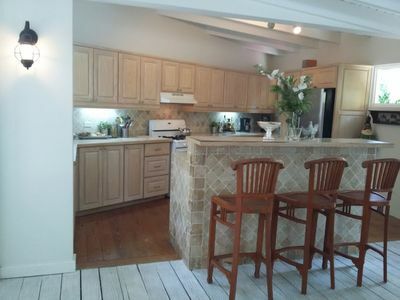 The well-equipped kitchen has a washing machine, dryer, coffee percolator, microwave, juicer and everything you will need if you choose to dine in. No1 has a private free car park. Please be advised No 1 Porters is a none smoking villa. We would prefer none smoking in or around the villa. 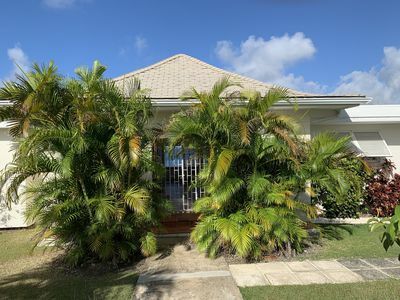 The villa has a desk area with a selection of books, wifi and modem (fast free Wifi) The open plan lounge & dining area is spacious and opens up onto the verandah with roman blinds to add intimacy for alfresco breakfasts or romantic evening meals. 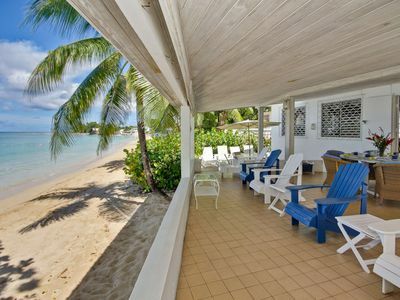 We have a BBQ on the veranda if you wish to buy some local fresh fish and try some Bajan cooking. 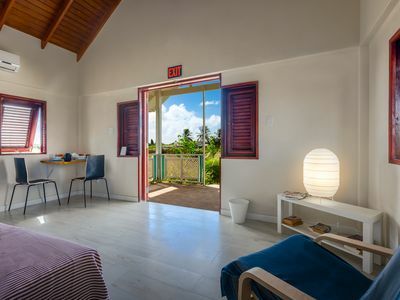 Our Bajan holiday rental villa is tucked away in a quiet corner surrounded by tropical well-maintained gardens, our private garden has two loungers and an umbrella for sunbathing. The swimming pool is conveniently near in the centre of the development, with plenty of loungers and umbrellas. 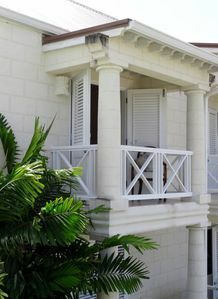 Our housekeeper visits twice a week to refresh the villa. Guests staying at No 1 have the advantage of the services of Jeanine our property manager who will greet you on arrival and provide you with gates codes etc, she will show you around the complex and assist you in any way she can during your stay. Jeanine can book tours and advise you re car hire etc. A 24-hour helpline number will be available to you. For water sports enthusiasts, Hobie cats, water skiing, boat trips & diving are all available on the beach. 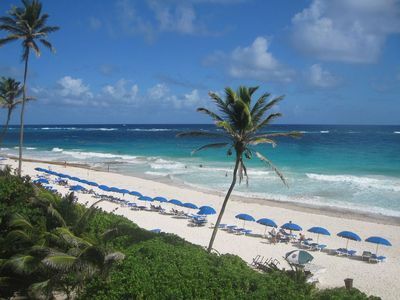 Snorkel just off the beach, feed Turtles by hand and be amazed by the stunning tropical fish. Two King size en-suite bedrooms, bath & shower (Can convert to twins if required) Bedroom two will take a third bed. All towels including beach provided. Desk, Libary stocked with a selection of genres to suit all. 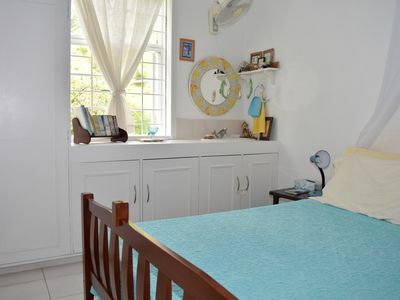 Tucked away in a quiet corner, with a private garden. Dining in or out on the large veranda with hammock. Blinds for private dining. Jeanine our villa manager will greet you on arrival and assist you during your stay. 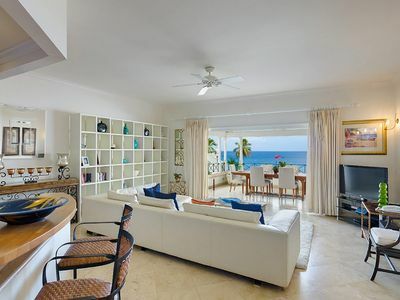 Extra Services: Services include arranging a taxi from/to the airport, welcome food pack on arrival, greeted at the villa by maid & property Manager who will assist you during your stay. 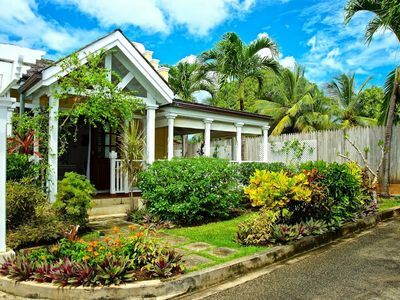 We take great care to cater to all your needs.Holetown is close by with Shops Restaurants, Banks, Medical centre. Limegrove Centre & cinema. 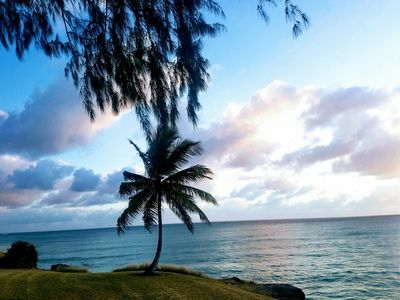 Barbados is special because there is so much to see in such a small area. 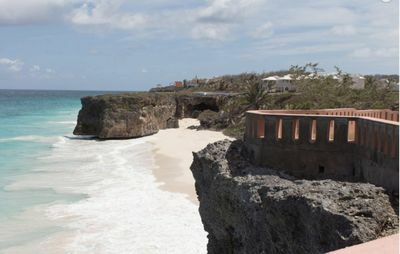 The landscape changes often from parish to parish and there are more attractions per square kilometre than in any other Caribbean island. 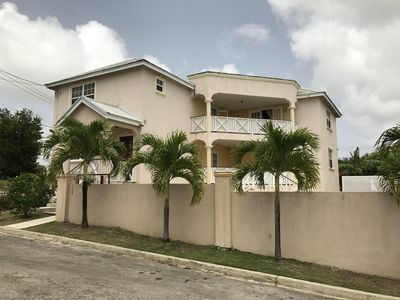 This is the perfect location for accommodation in Barbados. Local Transport is quick and reliable running from 5 am until very late. $2 Bds for any journey. Long-term rentals accepted. No 1 is a none smoking villa. You won't be disappointed, most of our guests rebook year after year. We will assist you from the booking stage to arriving at the villa and during your stay if needed. Home away from home. Enjoy this quiet get away. Totally relaxing and safe. Tropical Garden In The Sun.